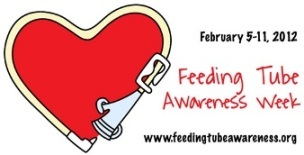 Our second annual Feeding Tube Awareness Week® demonstrated that the event is taking hold. More than 220 feeding tube families participated in the 2012 Awareness Week video, which highlighted the impact tube feeding has on families. It was viewed thousands of times on One True Media and Facebook. More than 2,200 people participated with several parents getting media coverage. Topic: Why awareness is important to my family - What would be difference for me/my child if tube feeding was better understood? Topic: Why I have/my child has the tube they have now - a highlight on the medical conditions that require tube feeding. Topic - How has your attitude/family/friends' attitudes changed towards tube feeding? What has awareness of the positive benefits done to change perceptions? Topic - What do you want clinicians to know about the day-to-day life with a feeding tube? Topic - Show us your awareness video / Share your awareness idea.